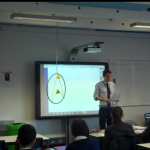 I am a teacher in the KSA Maths Department and I have just finished 2 weeks on Circle Theorems with my year 10 class. One of the philosophies of the KSA Maths department is ‘Singapore Maths’ where students are initially introduced to concepts via physical or visual representation, then with application and then on to the abstract or theoretical side. I have found it a real challenge making this topic tangible and creating learning that would stick in students’ minds (sticky learning) and so decided to use the revision to try to achieve this. 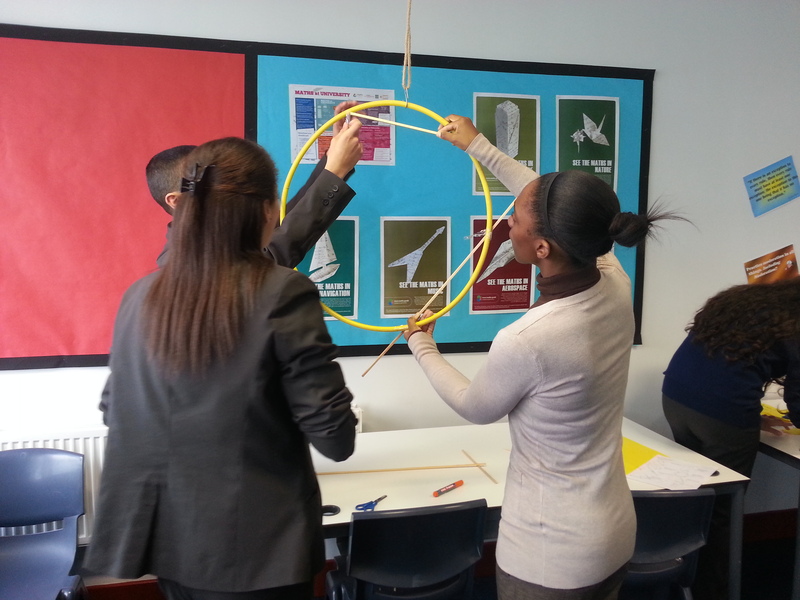 I used this lesson to create ‘life size’ representations of all 9 circle theorems using hula hoops and wooden sticks. I started the lesson with a ‘Do Now’ activity where students were given the theorem in words and they had to draw a picture to demonstrate this theorem. 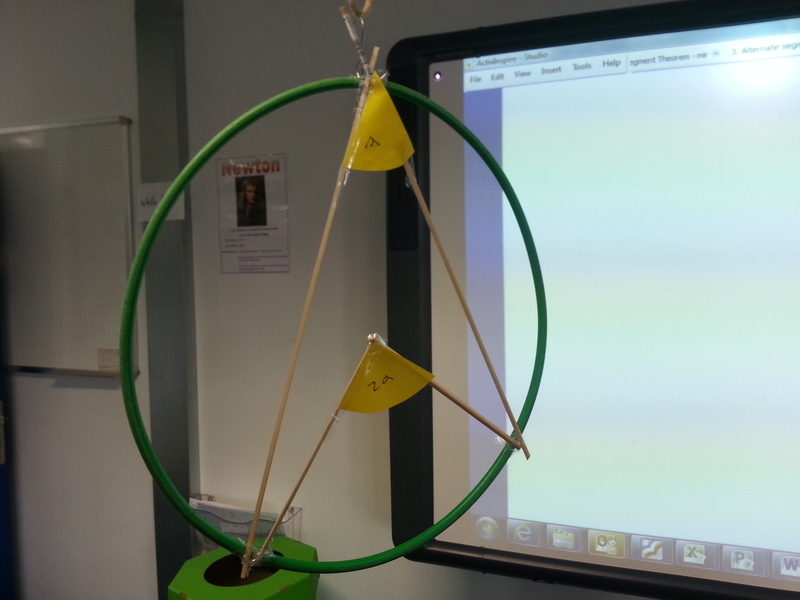 This ensured that all students had the correct theorems at the start of the lesson. I then brought a student to the front of the class to demonstrate how to make the theorem out of wood using one which I had started earlier. I asked the students to label the pertinent angles with yellow paper and also write the theorem out in full. Can you tell which theorem we’re making? Students were split into pairs and asked to create a separate theorem each. 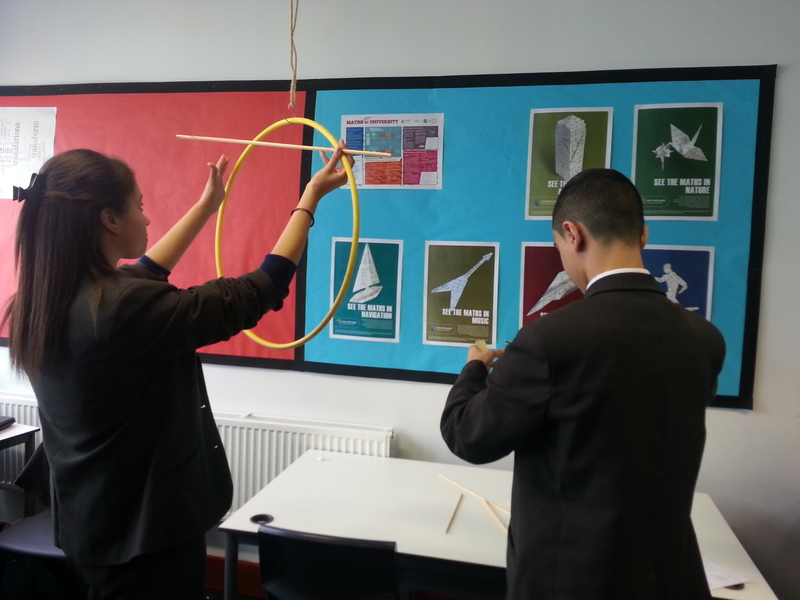 They spent about 20 minutes sticking wooden rods onto hula hoops to represent chords and hanging them from the ceiling. I left a couple of theorems spare for students who finished early to move onto. 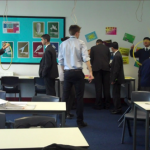 After completing the activity, students moved onto mixed practice questions and were able to look at the theorems at the back of the room if they got stuck. 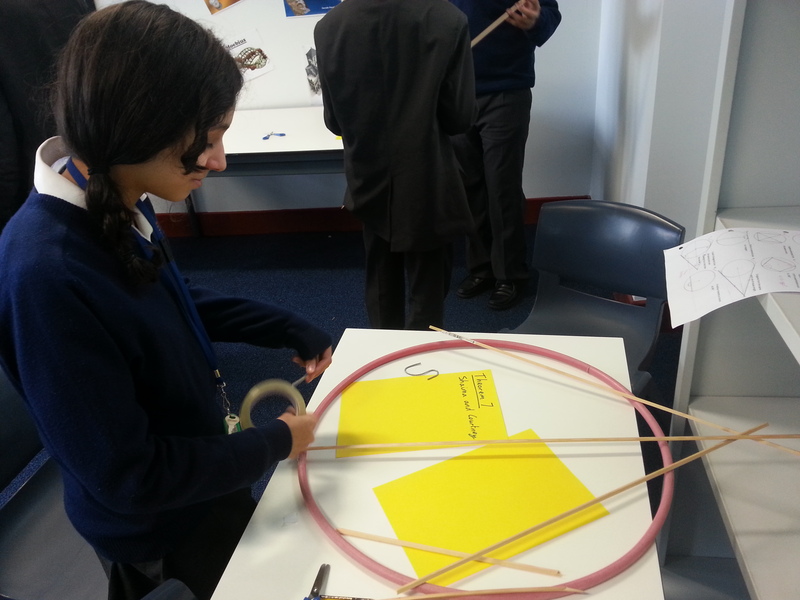 I found that the students really engaged with the practical nature of the task and enjoyed the pair work. 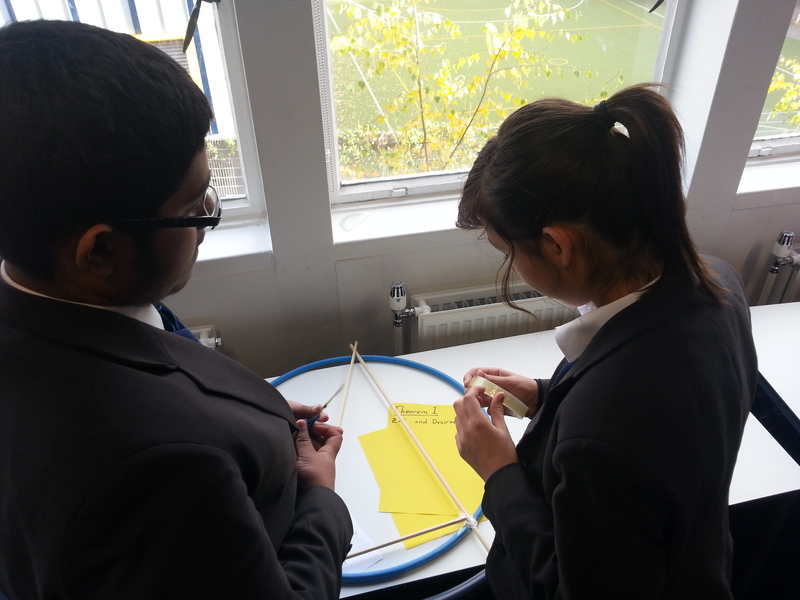 I hope the lesson will be memorable for them and will have embedded the circle theorems. Download the full pack of 34 files including homework, Exit Tickets, workpacks, IWB files and exam questions here. Change [one/two/three] elements on this hula model so that it gives you the same theorem on this hula model. How are these two theorems related? Does one lead to another? [Partly dismantle a hula model] What do I need to change about this hula model so that it represents theorem [1/2/3/4/etc] again? Sounds fantastic. I fully intend to use this when my yr 10s reach circle theorem! Hi, I’m teaching circle theorems at the moment and love this idea. I just wondered how the lessons went prior to this one? What sort of activities did the teacher do? There’s a bumper crop of workpacks and IWB slides in the resource section above. Typically each theorem had a lesson dedicated to it, which started off with ‘discovering’ the theorem and then putting it into practice. Adrian purposefully did things in reverse order, beginning with the abstract and concluding with the concrete on the basis of two suppositions – first that the primacy-recency aspect to memory would be best exploited by putting the most memorable (!) lesson at the end of the sequence; and second that getting students comfortable with the abstract and THEN showing them that the theorems work in real-life would reassure them the theorems weren’t just made up and were indeed worth discovering. For certain topics, I have found that abstract-concrete is stickier than concrete-abstract. That’s based on more of a gut feel at this stage rather than a hard and fast rule. Thanks, I should probably have looked properly rather than giving up so easily. I will let you know how it goes. I think I need to do more research on this ‘abstract-concrete’ sounds perfect for me so if you have anything that can send me in the right direction please do. This is great! I like using Geogebra, but unlike Sketchpad, Geogebra does not work well to discover the circle theorems. 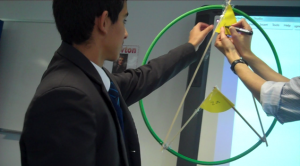 I see this as a fun way to demonstrate, but to also discover the circle theorems. Thank you for sharing! 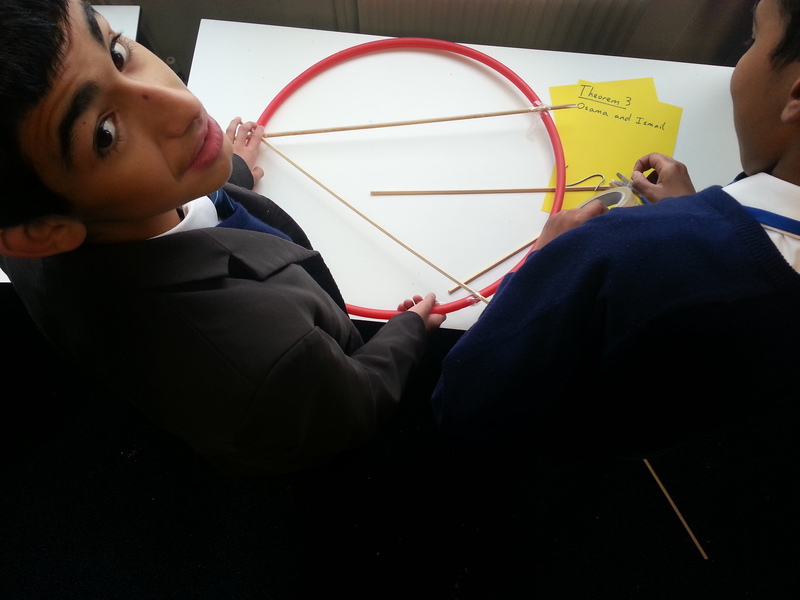 Fantastic way of teaching circle theorems ! 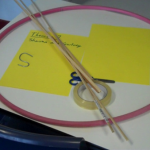 I used other manipulative to teach circle theorems known as ‘Ring of theorem’. The strategy was used to take their learning from ‘Unknown to known’.